It’s been an extremely busy week! As well as our frugal anniversary, we had a dinner party with friends, helped my brother move, and did quite a bit to get his new property ready. D and I are very social people and love to host people at our house. A few years ago D and I were part of a Christian community, and were in a team of 12-16 people at any one time. We had a shared meal once a week, which we took turns providing. Having had to cater for kids, vegetarians, and celiacs within that group means I do not sweat about dinner parties anymore! The most important thing I learned from that experience was to Keep.It.Simple. People don’t need fancy dinners if they are enjoying great hospitality. Some of the best dinner parties we’ve had saw us serve things like soup and bread, or a hearty stew. I use my slow-cooker a lot for such occasions so that I’m not running around like a headless chook when my guests arrive. The meals we serve are simply a larger version of meals we’d normally have, no searching for star anise or whipping up ganache for me. This week’s dinner party included lots of children and a vegetarian, so we had chicken wraps, with lots of fillings, and I made a bean burrito mix for my vegetarian friend. We roasted the chicken, and I made the tortillas myself as I cannot bring myself to buy them when I know how easy and cheap they are to make by hand (if you want the recipe, let me know). Friends gave us lots of fruit and nuts as a thank-you for dogsitting – which they totally didn’t need to do as he is a dream to look after. But it was very kind of them, and saved us buying any fruit for the week. We harvested even more feijoas, just when I thought the tree was done for the season. I planted seedlings that I had grown myself into my new vege garden, so I am looking forward to munching on winter veg in a few weeks. D and I recently chalked up four years of marriage (go us!). It’s been quite a ride in those four short years – career changes, two babies and the accompanying sleep-deprivation, moving cities, home ownership, and now the possibility of D starting a business with a friend. We have at times been rather frazzled around the edges, but mostly D and I enjoy being married to each other – a marriage which is definitely helped by us both possessing extremely silly senses of humour, and possibly by our shared passion for occasionally binge-watching TV (we’re currently working our way through ‘How To Get Away With Murder’, man are we hooked!). We are a family that needs no excuse to celebrate, so being on a Dollar Diet did not deter us one iota (I love that word, iota, I’m gonna use it more…). We put on our frugal thinking caps and came up with a lovely celebration. 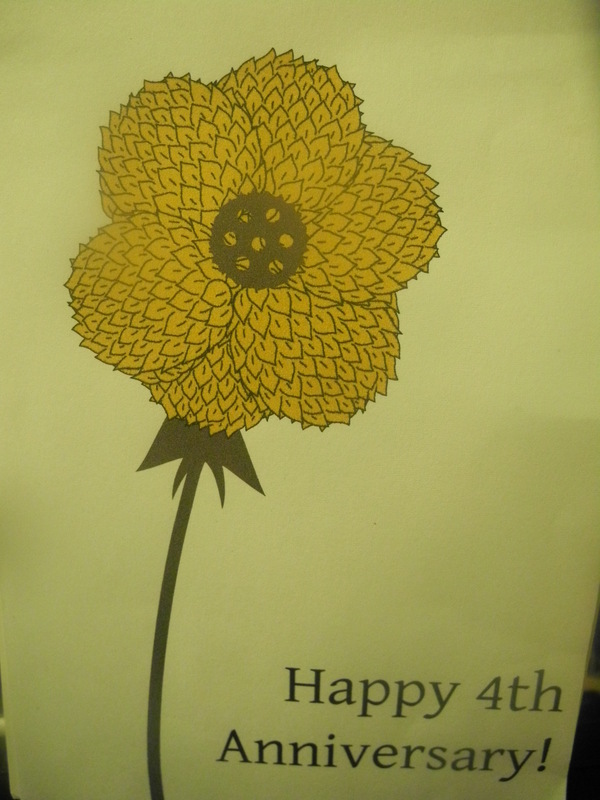 Traditionally, you give fruit and flowers for your fourth anniversary so it was an easy anniversary to do frugally. I already had an anniversary card, having purchased one last year when one of our bookstore chains had a 50% off greeting card sale. 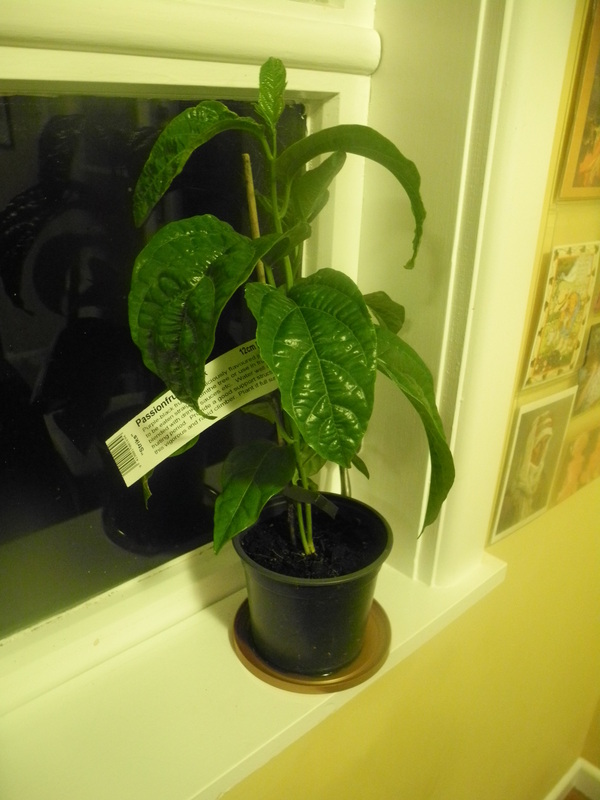 I gave D a passionfruit plant because a) he LOVES passionfruit and they grow well here in Whanganui, and b) well, I figured ‘passion’fruit was about as romantic as one could get when buying fruit! I also got him a pot of daisies because I reckon if D was a flower he’d be daisies: perpetually cheerful and sunny. We took dinner to our babysitter’s house. My MIL offered to babysit for us, and graciously let us use her house to stage a romantic dinner for two. She put out her best cutlery and crockery, candles, mood music, and even gave us a bottle of bubbly. I was just as excited about getting to eat a meal ‘out’ as I would have been going to a posh restaurant. I think our meal and gifts probably amounted to $25. Compared to how much we might have spent on a florist’s bouquet and fancy restaurant, I think we did very well. Now of course, if you want to give this a go, you’ll need a willing babysitter who’s not freaked out about having their place used for fine dining. This is my 13th week of Trim Healthy Mama-ing. I think I’ve only managed one week 100% on plan, but I still have entire days when I am completely on plan. I reckon I stick to it 80-90% of the time and weight is coming off nicely. My skinny jeans are getting so baggy I will need to retire them soon. I eat off-plan when I’m a dinner guest at someone’s house, and occasionally when my husband wafts a fresh loaf of his bread under my nose, but generally I find THM easy to stick to. Being sugar-free for the past few years means that the THM lifestyle hasn’t been a massive change to my diet, but I can appreciate that for many people it seems like a big challenge. In fact, if it all seems too much, I’d recommend giving up sugar before you attempt THM, or the THM desserts will call your name and therefore put a strain on your wallet. If you want tips on how to wean yourself off sugar before plunging into THM, here are my tips on how to do it. Of course, plenty of people have successfully gone cold-turkey, but I just think it is easier to do THM without the fancy ingredients when your sweet tooth is already under control. A lot of people lurking on the THM Facebook pages worry that adopting this lifestyle will cost them megabucks. It’s not hard to see why when mouthwatering THM desserts are posted on there daily – recipes which generally contain expensive ingredients like almond flour, erythritol, cream cheese and a cup of egg whites. But here’s the thing: you don’t need expensive ingredients to do THM. I keep things really simple. I generally have S breakfasts, E lunches, and a mix of S and E dinners (E dinners tend to be cheaper by the way). This simplicity is important to me as I want food freedom. I don’t carb count or agonise over whether I’ve just eaten a ‘crossover’ or not. I’m pretty sure the THM authors want this freedom for you too. We skip dessert and sweet snacks (we rarely eat dessert anyway). If I find myself hankering for something sweet I eat some Greek yoghurt. It’s not sweet at all, but the creamy texture feels ‘desserty’ to me. We eat a lot of ground beef, white fish and tuna. Inexpensive dishes like Taco Salad and Chili are staples in our house. I can’t stand sweet things for breakfast, and find porridge/oatmeal too stodgy to face first thing in the morning, so I tend to eat eggs for breakfast. I know many people get sick of eggs every day, but I don’t mind them – which is weird, because I normally hate eating the same thing all the time. At times when there is only one portion of leftovers, I eat last night’s dinner for breakfast. If I need a snack I might have a boiled egg, an apple with a smear of peanut butter, vege sticks, a ryvita with vegemite, or a couple of slices of tomato with a piece of cheese on top. We eat a lot of beans or rice. I love quinoa, but it’s pretty pricey so I only get it when my budget allows. Instead of making low-carb bread, or buying expensive low-carb wraps I eat Ryvita. We eat most of our pre-THM budget friendly dishes (usually they are very easy to THMify by just omitting carbs), like slow-cooked stews, Asian stir fries, soups and salads. We make protein go a long way by making simple stir fries, padded out with lots of vegetables. I make almost everything from scratch, except tomato sauce and mayonnaise. Lunch is often tuna salad, which is pretty inexpensive. I don’t buy almond milk (although it’s not too expensive here). Prior to THM I rarely had cow’s milk anyway, and figure a splash of it in my one-cup-a-day-tea isn’t going to kill me. We buy in bulk when we can. We are on a Dollar Diet, and that’s given us some fantastic wiggle room in our budget. I’ve been able to get loads of ground beef, chicken and fish at really low prices this way. If you are a ‘lurker’, don’t let all those tempting baked goods and desserts stop you from climbing on board the THM wagon. You can enjoy the ride without them. I plan to buy the THM Baking Blend and THM Sweet Blend one day so I can have fun in the kitchen, but until then I am content to chug along without them. What are your THM budget tips? Wow, 20 weeks into the year. Doesn’t seem possible! But yep, 20 weeks of our Dollar Diet done and dusted. Our new frugal ways have become like second nature and our bank account is looking much rosier. So we are not perfectly frugal. But I think we’ve made great progress, and our new behaviours are definitely beginning to stick. I look at clothes in the shops and can tell myself I don’t need them. I can let my kids grow out of their clothes without needing to dash out to buy more because they already have ‘enough’ thanks to hand-me-downs from friends. And tell myself that small children don’t need a huge wardrobe of clothes anyway. D and I no longer get to lunch time and say ‘I can’t be bothered, let’s buy some sandwiches‘. In fact, now I think ‘spending money on sandwiches? That’s completely loco!‘ We make our own damn sandwiches. We are experts at finding free stuff to do. We hang out at home and with our friends a lot more. We get into nature more. We make do, mend and upcycle more. There’s no deprivation. Just a good life. I’ve mentioned several times that my daughter, nicknamed Sausage, is a total bookworm. Here are her current Top Ten favourite books (with an extra thrown in for good measure). I must put in some disclaimers first. Sausage outgrew board books a long time ago, and now prefers surprisingly long and complex stories. She prefers Little Golden Book-type stories these days. If this doesn’t sound like your two-year old, don’t fret. My child is not a genius, the length of the books she likes merely reflects her bookworm nature. If allowed, Sausage would happily spend 88% of her time poring over her books, and the other 12% running around like a loon. Secondly, this is not an exhaustive list. These are just the books we have in our house or public library. I know that there are millions of wonderful children’s books out there. 1. Down the Back of the Chair, by Margaret Mahy. I think this is my favourite one on the list. Margaret Mahy, for my oveseas readers, is New Zealand’s best-known children’s author. Her books are somewhat like Roald Dahl, dripping with luscious and fantastical words, but her stories are much more light-hearted. I loved her books as a child and it is wonderful to be able to share them with my own children. Down the Back of the Chair is one of Mahy’s later works, and tells the tale of a family facing ‘rack and ruin’. Dad loses his car keys, so toddler Mary suggests that he look down the back of the chair, where he promptly finds a lot more than keys lurking in the chair. Mahy was an absolute master of rhyme, and this book is filled with delightful, funny verses that will capture the attention of any toddler. The objects down the back of the chair are side-splittingly ridiculous, and the ending is outrageously heart-warming. An absolute joy to read. Even when it’s over and over and over. 2. A Lion in the Meadow, by Margaret Mahy. One of Mahy’s older books, A Lion in the Meadow is a whimsical tale of a boy who discovers a lion hiding in the meadow by his house. His mother, thinking the boy is making up stories, makes up one of her own about a dragon, and suddenly all sorts of things happen. It’s a beautiful story of the power of imagination, and the gorgeous illustrations will entrance any tot. 3. 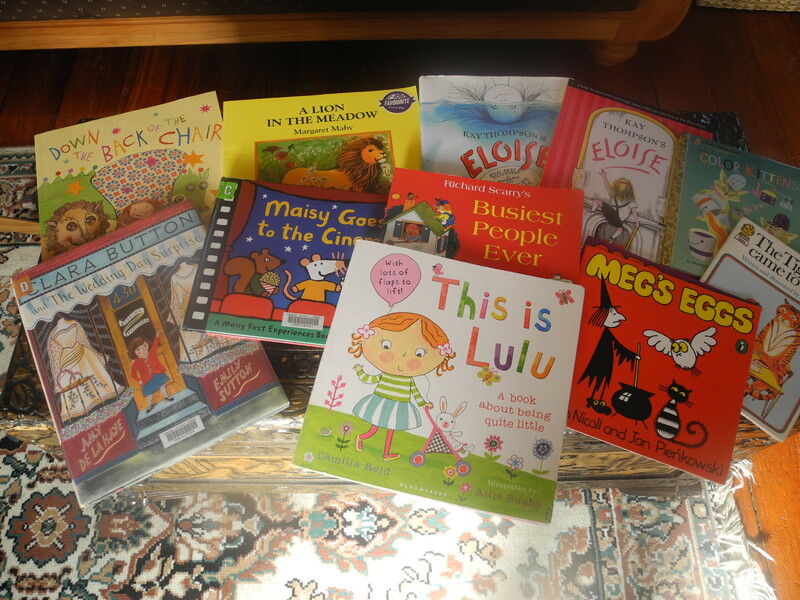 Any of the Maisy stories, by Lucy Cousins. Despite being too simple for Sausage now, Maisy and her friends still hold a special place in her heart. Cousins’ simple illustrations are very appealing to tots, and her stories are about things familiar things in the world of the toddler, such as Maisy’s Bedtime, Maisy Drives the Bus, and Maisy’s Morning on the Farm. Sausage currently loves Maisy Goes to the Cinema. It explains exactly what happens when you go to movie AND even has pictures of characters sitting on the loo. Yep, Cyril the squirrel takes a dump. What’s not to like? The ‘surprise’ is lovely, and is sure to get children thinking about celebrations in other cultures. 5. The Lulu books, by Camilla Reid. Again, these are books that Sausage has outgrown, but still adores. We have This is Lulu and Lulu’s Loo. This is Lulu is a book about ‘being quite little’, and it captures exactly what it is like to be a 2 year old girl. Your tot will find many familiar things like pets, toys, friends, and daily routines in this book; which is charmingly illustrated, and has lots of interactive flaps to open and shut. 6. Any of the Meg and Mog books, by Helen Nicoll and Jan Pienkowski. It’s no surprise that Meg and Mog are firm favourites with Sausage, given that her Dad used to read Meg’s Veg to her almost every day in the womb. The simple storylines and language are perfect for wee ones, and Jan Pienkowski is an artistic genius. His use of bright colours and almost stick-figure like characters are just so engaging that you can’t help but smile. I loved these books as a kid, and they have stood the test of time well. 7. Any Richard Scarry book, like Busiest People Ever. Again, these are favourites from my childhood. The detail and description in these books is so, so satisfying for children. Everyone and everything is labelled. This is what toddlers want and need, and these books may save you a few endless rounds of ‘what’s that?’ when you are out running errands in an all-fired hurry. They are a little bit dated, and you may want to get UK or US versions depending on where you live, so that words such as ‘lorry’ or ‘truck’ match what you would use. 8. The Eloise books, by Kay Thompson. My regular readers will know that Sausage’s real name is Eloise. Whilst our Eloise was not named after this character, this Eloise holds a special place in our hearts. Eloise is an extremely likeable ‘enfant terrible’ who lives in the Plaza Hotel in New York, and is attended to by her long-suffering Nanny. The stories are told in the first person, in the wonderful stream-of-consciousness that small children have. Sausage’s favourite book is the wonderful Eloise Takes a Bawth, in which Eloise manages to flood the entire hotel and somehow it all turns out well. 9. The Colour Kittens, by Margaret Wise Brown (actually it’s called The Color Kittens, but I use UK English and omitting U’s feels so wrong). Wise Brown is the author of Goodnight Moon, so you know straight away that here is an author that knows what she’s doing. The Colour Kittens is a delightful tale of two kittens who paint, and describes which colours are made when you mix them together. It gets a little trippy towards the end, but it’s still a lovely and quaint story that will delight young readers. 10. The Tiger Who Came to Tea, by Judith Kerr. This book from the 1960s is a gem. Sophie – clad in some groovy threads – and her mum are sitting down for a spot of tea, when who should ring the doorbell, but a tiger? Sausage loves this book as the tiger is very ‘naughty’ and Sophie gets to go out in her nightgown. Thrilling stuff. 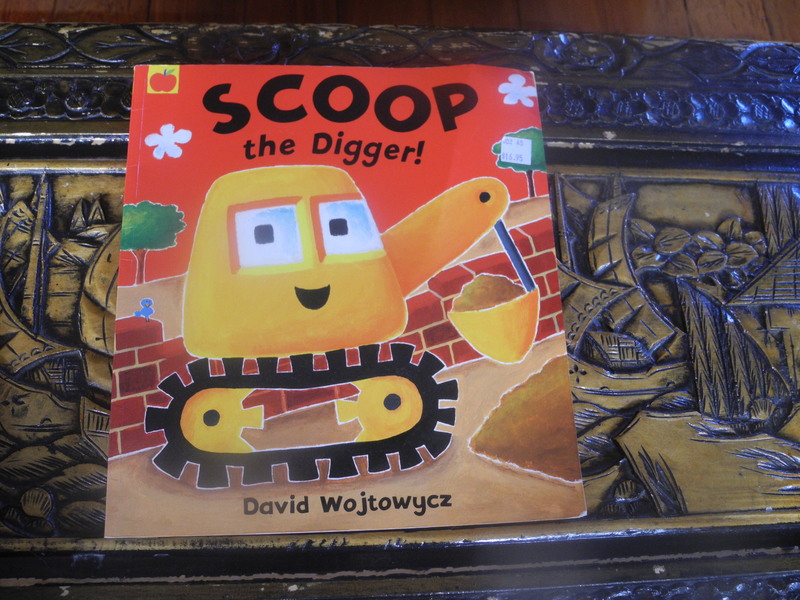 Scoop the Digger, by David Wojtowycz. Not to be confused with Scoop from Bob the Builder, this Scoop thinks he has the best job on the building site. He tries to show off to his other building mates, but ends up with mud on his face. What books are on your two-year old’s list? This week’s update is rather boring I’m afraid. 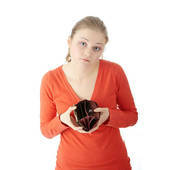 I have no amazing tales of frugality to share, nor do I have any epic tales of woe in failing my Dollar Diet. Our biggest expense this week was getting a key cut for our new (new-to-us several months ago) car as it only came with one. D and I could have lived with one key, but D was worried about the horrendous cost (over $500) of getting a whole new key made should we loose ‘the one true key’. 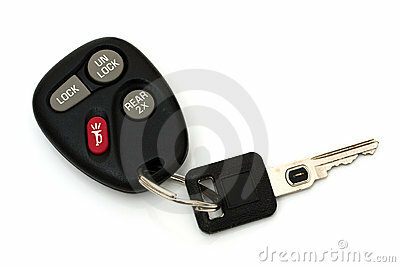 So we took the cheaper option of getting a copy of our current electronic car key made, which was still $180! Damn these electronic locks. Our holiday budget is now only $860 in the red, having paid off my holiday to Adelaide with Dollar Diet savings. We will be able to get it back in black in a couple of months, in plenty of time for D and Sausage’s September trip to the Netherlands to see family. After their holiday, we’ll probably throw some savings at our car and home maintenance budget, and Christmas (although I intend to make our gifts this year, we’ll probably need to up our food budget a bit as we get lots of visitors over the Christmas break). I can definitely say that some of my earlier frugal mojo has waned, as I was reflecting yesterday that I have been rubbish at making gifts lately (Mother’s Day, birthdays etc). Life has been busy and I am just plain tired and uninspired. I need to get some supplies to make gifts with, and carve out some more crafty time again. We kept Mother’s Day low-key (we do this anyway, Dollar Diet or not), but I was treated to a special breakfast and lunch. I was given a cheap-and-cheerful bunch of flowers with a home made card, and got to eat my breakfast in peace. Bliss. D and I will have to put our thinking caps on as our wedding anniversary is coming up soon, and our eating out budget is set at zero for this year. Today I received my first Trim Healthy Mama compliment. This week has been a very good one for staying ‘on plan’. Mixing up my ‘S’ and ‘E’ meals is becoming pretty standard. I normally have S breakfasts, E lunches and S dinners, which isn’t a huge change from how we ate before THM came along, just minus bread. I haven’t weighed myself, but I continue to see results in the mirror and with the way my clothes are getting looser. I have been using clothes as my guide because it does seem to be a more accurate way to ‘measure’ results. I popped into a department store where I have bought many clothes from in the past. Their clothing is pretty standard between brands (unlike many other department stores!) and I was curious to see what size I could get into now. I am now three sizes smaller for tops and two for bottoms. Wahoo! This plan works. It’s not a super-fast results diet – which is not the sort of diet you want to be on anyway as they never work long-term. It’s more of a slow-and-steady-wins-the-race way of eating. I’m happy to be a tortoise.